When packaging product into boxes, it’s often important to make sure the box is in the exact right position, especially when a robot is doing the packing. While there are a variety of options for positioning a box, the system shown here allows for various sizes of box to run on the same system while also fitting into a sanitary environment. 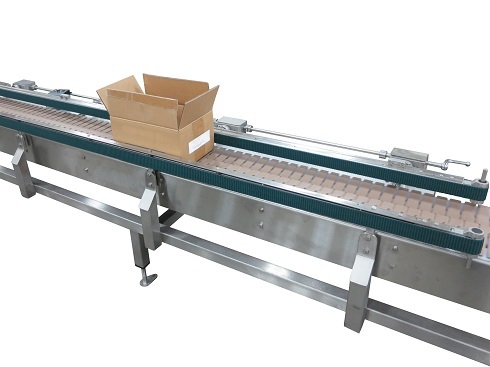 These AquaGard 7100 Series sanitary conveyors are equipped with two conveyors on top that act as “squeezers” for the various sizes of boxes. This ensures that the boxes are in the correct location to be filled. The 7100 Series conveyors are running alongside another conveyor that carries the customer’s product (the top conveyor in the drawing above). A picking robot will be placing a product into the box as it travels down the line. The squeezing effect guarantees that the box doesn’t move out of place as it travels along and the robot can know the exact location of the box. The two “squeezing” conveyors are Dorner’s AquaGard 7200 Series, our low-profile sanitary conveyor. On this system, they are set 8.875″ apart with +/- 1.5″ of adjustment to accommodate the various sizes of box.